HONG KONG, Oct 29, 2018 - (ACN Newswire) - The Hong Kong International Lighting Fair (Autumn Edition), organised by the Hong Kong Trade Development Council (HKTDC), runs until 30 Oct at the Hong Kong Convention and Exhibition Centre (HKCEC). One of the key sessions at the fair is the Smart Lighting Development Forum, held on 27 Oct, at which industry experts discussed current trends in smart lighting, the development outlook, and exciting possibilities for the industry. Smart lighting has great potential for both industry participants and society as whole, according to speakers at the Smart Lighting Development Forum. 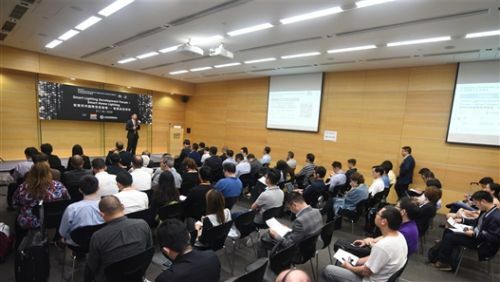 They detailed how industry collaboration is helping to develop open standards and advanced connectivity platforms, which will make smart lighting more exciting, helpful and desirable for consumers. The main factors behind the growing popularity of smart lighting are, according to Guang Yung, Vice-chairman of the Shanghai Pudong Intelligent Lighting Association, the technical advances that are being made, particularly in the use of light emitting diodes (LEDs), together with growing demand from consumers. LEDs have the potential to revolutionise smart home lighting through their high illumination, signal strength and ability to transmit wireless data at high speed. The main goal of smart home lighting, he said, was to put people first by helping to meet their needs. He pointed out that demand was evolving quickly and that the industry needs to sort out solutions, particularly in relation to network construction, to meet the growing demand from consumers. "We need a universal platform that can deal with different protocols from different producers," he said, predicting that a breakthrough in smart lighting would happen in the very near future. Eric Jiang, CEO of Qingdao Yeelink Information Technology, spoke on the topic of smart lighting in the age of artificial intelligence (AI). Traditionally, smart lighting has been controlled by mobile apps, he said, but this is not ideal because users first need to start the phone, unlock it and input instructions. New devices using voice-control functions are much more convenient, but Mr Jiang said the market is not yet mature and the extra cost of paying for more advanced devices may be too much of a hurdle for consumers - which is why his company reduced prices and took a cut in profitability to help build a very strong market position. "LEDs are more expensive," he said, "but they make lighting products that are more efficient and much more interesting." The use of voice control systems has great potential for smart lighting, Mr Jiang explained, but there is still some way to go. He pointed out that in China, the majority of voice control devices are used for music, with only 15% used for lighting control. "The absolute number is small because of the limited availability of smart lighting devices," he said. At present, his company's customers have an average of only 1.5 smart lights each, but voice control is helping to build demand for smart lighting. Mr Jiang suggested that if large AI and Internet of Things (IoT) producers such as Alibaba can subsidise the cost of smart devices, the market will develop more rapidly and consumers will be encouraged to upgrade their smart devices to benefit from the latest technological developments. He also mentioned that the ability to localise products - such as providing a variety of hues for the European market and integrating smart lighting into ceiling fans in Southeast Asia - is important for the development of the smart lighting market. Cooperation with local players is essential for understanding local markets, he said, explaining how his company's business in South Korea is booming thanks to cooperation with local companies. In Europe, the number of different languages and relatively small markets make cooperation with local companies even more important. Mr Jiang cited an interesting statistic which shows that once a consumer makes his or her first smart lighting purchase, the second follows within six to 12 months. "We need to make products that are appealing and convenient to encourage that first purchase," he said, explaining why small, relatively inexpensive lights form a large part of the company's product line. Looking forward, he said that the next focus for the smart lighting industry would be network integration, explaining that the smart lighting industry would benefit if standards and a common platform could be developed by major industry players, as happened in the telecommunications industry. Neil Wang, CTO of Shenzhen Jingxun Software, said that while smart lighting first appeared around 2014, system functionality hasn't improved much since then. Everyone is looking for a breakthrough, he said. People find smartphones too clumsy for light control, while voice control instructions need to be given very clearly, which ruins the experience for some. He suggested that the key was to offer an improved experience, so that like the mobile phone, which progressed from being a device used simply for phoning and texting to one where you can watch videos and take high-quality photographs, the goal should be to provide a wide array of convenient functions that will help consumers become more attached to their smart lighting devices. Mr Wang said many appliance manufacturers want a one-stop platform that will allow consumers to control a range of appliances from different brands in the home. He suggested the solution was to build a cloud system for Asia that could host thousands of different devices from different companies - a platform of connectivity - that would make life much easier. For example, when you are a certain distance from home, you would be able to turn on a range of different appliances that are all integrated on the same platform. "Technology is the driver of new business," said Xing Cheng, Smart Terminal Staff Product Manager of Alibaba A.I. Labs, "and we want to be number one in AI." This, he said, will involve strategy, development and cooperation. Communication through smartphones was the first stage, which is now being replaced by voice and video. "If users can control smart devices by voice, it will expand human space," he said. Hardware gateways have been transformed into the cloud, where users can now find a range of different services. "The super-gateways now are the social media giants," he said, "but in the future, AI will become the super-gateway, providing an all-in-one service using voice control in which people will become the centre of products and services". Mr Xing said that voice, picture and facial recognition are already possible, with emotion recognition coming soon. Bluetooth will be replaced by voice control over the cloud, so that lights in the home and office will be controlled through speech. "With our partners, we can build this ecosystem," he said. "The cost of LED lighting is falling daily," said Qi Xiaoming, CTO of Opple Lighting, "and LED luminaires and fixtures are quickly gaining popularity, with demand in China growing faster than the rest of the world." Mr Qi explained that in the tech sector, Bluetooth is still booming and Wi-Fi is doing well, "but a new ecosystem is needed," he said, because people are confused by the number of options available. The solution to this complexity, he said, is to erase borders, cooperate with other specialists, and remain customer-focused. Smart lighting is beginning to evolve from isolated products into a cohesive system. In China, for example, 20% of the market is IoT-enabled, but companies now need to adapt their products to meet the specific needs of different groups, such as children, adults and the elderly. "The focus should be on people-oriented lighting solutions," Mr Qi said. "Customers want appropriate, simple, convenient technology." He explained that, as a global provider, Opple believes that cooperation and building a shared ecosystem is key to the future of smart lighting. For example, through its cooperation with Huawei, Opple has had to reduce its prices, but volume has gone up to compensate. "The platform players make the rules of the game," he said. "In 2005, 90% of mobile phone owners used their devices only to make calls. In 2017, this number was less than 5%. The same will happen for connected lighting," predicted Bob van der Linden, Global Product Manager of Phillips LED Drivers. "In 2017, 99% of smart lighting was used only for illumination, but by 2030 more than 40% will be for other purposes, such as heat mapping, traffic monitoring, city safety and asset management." Connectivity trends in office lighting were moving beyond energy saving, he said, with new applications emerging that focus on space optimisation, conference room scheduling, safety and security, and maintenance management. At the retail level, smart lighting is being used to improve the personal shopping experience by changing the mood in fitting rooms and providing dynamic lighting displays. In large warehouses, smart lighting is creating huge energy-saving potential through the provision of lighting on demand. Meanwhile, new applications are helping to provide inventory tracking and maintenance management solutions. Mr van der Linden discussed some of the features of Philips Hue, a voice-controlled personal wireless lighting system. Its sensor-ready (SR) ecosystem is now standardised and completely open, allowing Philips Hue to partner with third-party sensor companies. Its ZigBee-controlled Smart Hub can connect up to 50 Philips Hue lights and is compatible with Apple HomeKit, Amazon Alexa and Google Assistant. Philips also has a partner programme in which the company offers hardware and software for its clients' luminaires, a variety of light sources and modules, and a software development kit for controls and switches, all of which are compliant with the relevant standards in each global market. "Philips Hue and Philips SR are based on open standards and a broad ecosystem with global partners, making it future-proof," Mr van der Linden added.